Released July 2010, it is basically just a series of placemarks in a website surrounding the Google Earth web plugin. It works well enough to guide the user around to a number of the prominent hotels and sights, which are accurately portrayed. The good news: It's beautiful. Soft colors, lush farmland, sparkling streams, waterfalls, and lots of trees. The bad news: There is no attempt at geographic reality. Deserts are turned into farms, large towns appear where there are none, and only a few highways bear any resemblence to their actual location. Giant silos (like in Iowa) dot the Hawaiian landscape. Streams flow uphill. There are also bugs, which cause thousands of trees to float far above the ground. 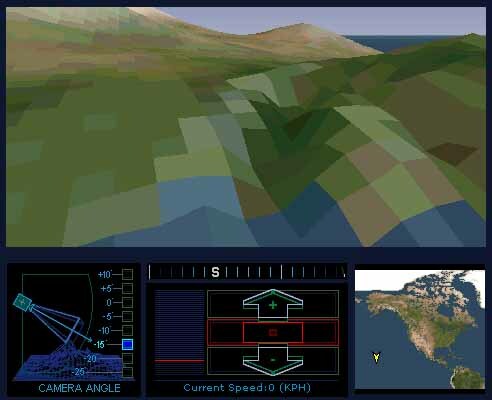 Basically, its made to looks pretty when seen from a large distance from an aircraft, which understandably is the point. an excellent consumer CDROM ($40) demonstrating the appeal of Hawaiian geology, ecology, etc. includes a few Hawaiian courses such as "Kapalua - Bay Course"
not entirely real-time 3D, but it does use billboard textures for trees, buildings etc. "the most comprehensive source of global geographic and cultural information and the best tool for effortless exploration of our world"
"now offers a new perspective on the world with vivid, 3-D views for most of the planet"
The Virtual Experience Nightclub in Waikiki has opened. The technology was created by Honolulu-based Six D Inc. It allows the customer to see 3D images in "real time." Patrons can fly around objects, such as dolphins. They can also explore virtual worlds with no predetermined path. 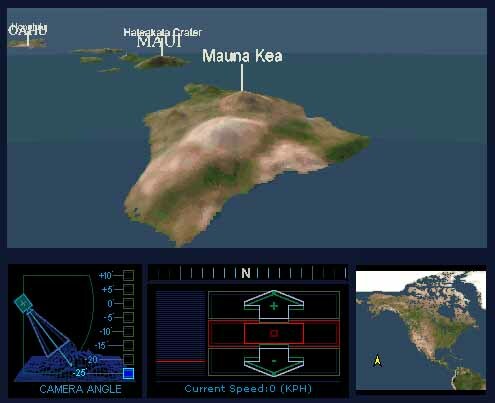 Specific features of the Waikiki application include 12 wide-screen plasma flat panel displays mounted on the walls that allow customers to traverse through several virtual worlds running on Intergraph TDZ 2000 ViZual Workstations and browse food and beverage menus from the convenience of their booth. The customers use advanced joysticks, called Spaceballs, to maneuver through the virtual worlds and menu selections. Six D Inc. is based in Honolulu, was formed in 1996 by Fernando Diaz and Vince Mitchell. The company custom-designs applications of virtual experience technology for companies worldwide.